Literacy in a Material World – Or Not. The number of administrative emails I’m getting means the summer is clearly about to be over and the new academic year is on its way – the large wave I can sense just beyond the horizon. So, after a summer away from the blog – with some work and some play – I’m drawn back here to start trying to work through some of the things that I’ve been kicking around since May. In work terms, the highlight of the summer was time spent at the University of Sheffield, both at the Center for the Study of Literacies conference, and in talking with people about plans for my Fulbright there in January. Once again, the conference was a great experience. Small, focused, yet full of surprises, I found myself filling page after page of notes from people like Jennifer Rowsell, Lalitha Vasudevan, Cathy Burnett, Guy Merchant, and Jackie Marsh. This year the presentations and conversations kept coming back around to the connections/issues/possibilities of how we conceive of literacy as constantly moving between the material and the immaterial. Whether it is the pondering of what being “literate looks, sounds, or feels like” (from Lalitha Vasudevan) or the ways in which children on playgrounds embody in their play the texts they’ve been reading/playing online (Jackie Marsh), or the question of how we think of literacy when it inhabits both the material and immaterial at the same time. This final idea, or the fluid nature of literacy in terms of the material and immaterial has been sticking with me since the conference in July. Jennifer Rowsell gave a splendid and thoughtful talk about the fluidity of literacy as it exists in the material and immaterial simultaneously. On the one hand, a text, in whether on paper or screen is a material object, and requires material resources to produce. Yet what is produced is simply representation, marks or images on a page or screen that are only meaningful – or bothered with – as immaterial representations of other ideas or things. Literacy is not a material thing. It’s a concept, a skill, an argument. Yet it is perceived by the creation of things. Her talk had been thinking about how the strength of print in particular is its ability to represent the immaterial – emotions, ideas, dreams – and yet can only do so through writing words that are material, but always incomplete representations. And one implication of this fluid sense of the materiality and immateriality of literacy is that it helps explain some of the confusion and conflict that exists in the culture at large when conversations turn to literacy. On the one hand, because there are material artifacts, it seems as if literacy is something we ought to be able to define, categorize, assess, know when we see it. Yet, because all we are seeing in the artifact are incomplete representations of the immaterial, because it is impossible to determine what being literate looks and feels like, any method devised to categorize literacy through work with the materiality of texts inevitably is either simplistic and unenlightening, or contextual and complicated to the point that it isn’t useful (like a map in a Borges story) or is rejected as impractical by institutions interested in efficiency and summary. I think anyone in literacy and education has felt the frustration of others outside the field who push for material and direct – and simplistic – assessments of texts we know to be complex and nuanced. There are also implications in other areas of our work too. For example, as director of a Writing Center I’m not above trotting out the old chestnut about how the goal of Writing Centers is not just to create better writing, but to create better writers. It’s not that I think that’s a bad philosophy (though I think as many have pointed out there are complexities there that need continual unpacking). But it is the case that when we talk about better writing or better writers, we are also dealing with a situation where a constellation of material and immaterial concerns come together in subtly complex and shifting ways. The simple concept of having a draft the student wants to improve moves quickly from the material text the student and consultant are reading to the immaterial goal – and perception – of “improvement.” And this is just the start and doesn’t even begin to get at issues of embodied responses, the immaterial presence of the instructor who wrote out the material assignment and so on. There is much, much more to work on here and I’m only musing on the surface for now. In the meantime I want to point anyone toward the much, much smarter exploration of some of these issues that will be coming out soon from Jennifer Rowsell, Guy Merchant, Kate Pahl, and Cathy Burnett. For me this conversation came along at a the perfect time as I begin to ponder a new project that will bring me back to the territory of literacy and identity (more on that to come in time.) 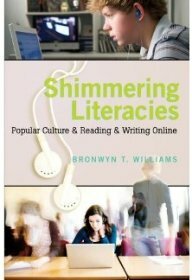 And, as won’t be a surprise to some who know me, I also found that it connected me back to popular culture and literacy issues (and more on that to come sooner). Once again, my thanks to the organizers of the conference (Kate Pahl and Julia Davies) and the all the participants who talked of such a range of ideas and perspectives with generosity and insight. More to come soon. The conference at the U of Sheffield sounds amazing. To respond to your post: That tension bw the material and the immaterial aspects of literacy really is interesting– As I sit in meetings of the Advising Committee, University Senate or whatever, I am so aware that we are often focused–sometimes for the whole meeting–on discussing a text, haggling over a single word or sentence, debating what to highlight, what to delete, and so on. I wouldn’t describe this work as “improving the writing” in the ordinary sense–though there is that too. It’s more like the text is providing an occasion to understand and realize certain things–maybe we could call it an essential catalyst. Could the new Master’s program (or whatever we’re discussing) come into being without that text? As faculty members, we really dig in and use texts in this way–to shape realities. Do our students get that opportunity? If students are focusing on the material object of the text it is likely because they will be graded on it–as evidence of their abilities as good writers or good writers in scare quotes. In the writing center, we have the luxury I guess I would call it to hold the tension in play–but again, it is all to easy not to do that. There is an interesting tension there, isn’t there, Amy? We do tend to focus so much on that material text in the departmental meeting – as we just did the other day – and at the same time so much of the discussion around what we want to do with the text is also connected to those immaterial concerns we have – about a vision for the department, or the political context at the time, or how tired we are at the end of the week. All of that is swirling around in the room, in the comments, in the little asides we make, and so on, but all that comes out of the meeting is the approved document. So the student who reads the document takes it as a hard, material fact (though, of course, interprets in her own way) and doesn’t get all the less tangible discourses that went into creating it. And then so often teachers do the same thing to students, I think. The text is what we focus on and miss the context the student knows about how it came into being. I’ve been talking with my new Writing Center consultants about that, about needing to sometimes pull back from the text and try to understand more about the emotional and material and other contexts that the student went through – and is going through – to create it (not that I’m alone in advocating this, of course). Great food for thought! Thanks!